When will be Trawlermen Tales next episode air date? Is Trawlermen Tales renewed or cancelled? Where to countdown Trawlermen Tales air dates? Is Trawlermen Tales worth watching? Series following the fishermen of Newlyn and the families that they leave on shore when they go to work. Scott finds out he is about to become a father. Merryn, Alan's daughter has hidden the keys to his boat, which he desperately needs to get back onto. Dale and Claire finally tie the knot after 14 years. A trawler breaks down leaving Jimmy Barnes and his crew with a loss of thousands of pounds, but the engineer on board may just have the solution to hand. Scott makes it home just in time to drive his wife to the hospital for her to give birth to their new baby. Jimmy has finally found the woman he wants to settle down with. During a stormy season, the men can ill afford to stay at home, so sail into the bad weather hoping that they may be paid better prices at the market. A shark is then found in one of the nets and has to be returned to the water as soon as possible before it snaps at them. 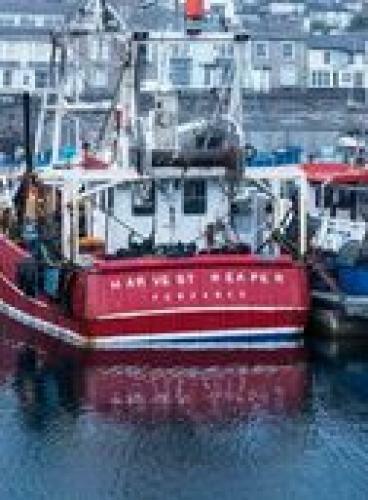 Trawlermen Tales next episode air date provides TVMaze for you. EpisoDate.com is your TV show guide to Countdown Trawlermen Tales Episode Air Dates and to stay in touch with Trawlermen Tales next episode Air Date and your others favorite TV Shows. Add the shows you like to a "Watchlist" and let the site take it from there.